One Element, the outdoor social fitness company has found new turf in Belfast. Become a member from £30/month and you’ll get access to trainer-led high intensity workouts in the beautiful setting of Orangefield Park. Sessions are on Monday and Wednesday evenings and Saturday mornings – come along to be a part of this growing new fitness family. Our tried-and-tested results-focussed sessions are already proving popular. Why not try OE Belfast for yourself? On a sunny Saturday in beautiful Orangefield Park in Belfast, 18 energised new members gathered for the first One Element Belfast session. 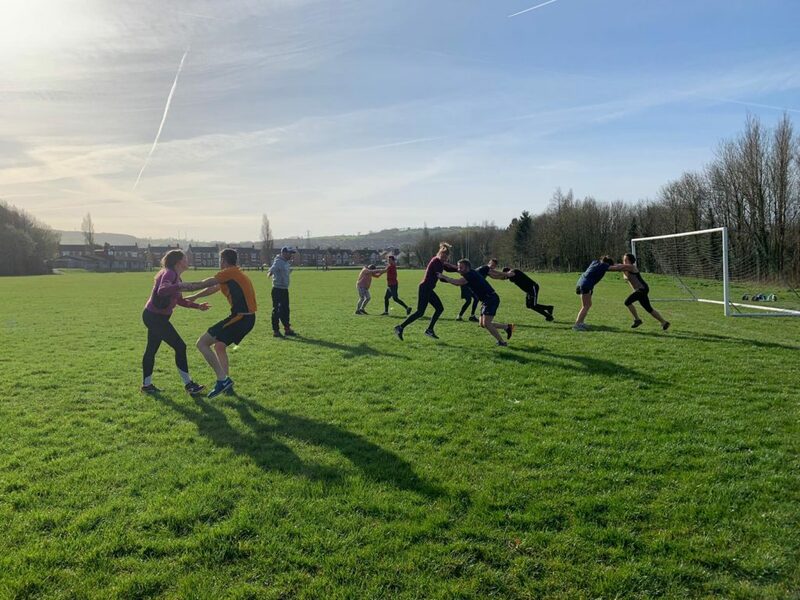 This new One Element (OE) community is now the fourth franchise to bring the OE social fitness model to green spaces around the UK, this time in Northern Ireland. Whilst boot camps have sprouted up in Belfast, these dynamic new sessions fill a gap in the fitness market in this city – for outdoor, all-year-round training sessions with a social emphasis. When Helen Cooke (One Element Belfast founder) moved from London back home to Belfast, she met a number of people that had recently moved to the city and were looking for social opportunities, as well as a regular fitness outlet. She saw the potential for a fresh and original social fitness community in the heart of Belfast. As a member of One Element for four years whilst living in London, Helen experienced first-hand the sense of community that being part of the One Element family brings. It’s a space to meet like-minded people who love to get fit outdoors, enjoy rain or shine, and have a laugh in the process: “it’s a very supportive environment to be exercising in, whether it’s the motivation from the trainer or hearing a new friend shout your name as you pick your knees up for that final shuttle run”, she says. In addition to filling the need for a truly social fitness community in Belfast, Helen points out the benefits One Element training can bring in terms of consistently achieving fitness goals – benefits she wanted to bring to her hometown of Belfast. Helen also saw this gap in the market through her work as a physio: “it’s extraordinary the number of people who need motivation to exercise regularly”. Sticking to that evening run or early morning gym session can be a challenge, but regular exercise is much easier to keep up when there’s a group of friendly faces expecting you. Helen’s background as a physio supported her belief that the sports-specific and pre-season style training is what we do best. Indeed, One Element’s training sessions have been proven to deliver results, whether your goals are rapid fitness gains or weight loss. They’re based around the science of HIIT training which has been found to burn 25-30% more calories than other forms of exercise. OE training sessions appeal to anyone; from long-time fitness fanatics, to beginners looking to boost their power and strength to hit their first 5K. That’s not to mention the all-round effect of the One Element endorphins – high-intensity tailored workouts, socialising and positive encouragement from your trainer that keep you coming back to training! So, when One Element launched its Franchise Opportunity, Helen decided to jump in and bring the benefits and ethos of One Element to Belfast. It’s off to a flying start, with the first few sessions attracting great numbers of new members, whose primary feedback was how much they enjoyed the session whilst still keeping up a high intensity of training. OE Belfast’s Orangefield Park location is central to many residential areas, and close to Guilt Trip where members can get together for the all-important chat and coffee after training. Future social gatherings will take the form of cycles out to the Peninsula along the Greenway, activities and barbecues in the park, or coming together to take part in the many running and cycling events happening across Northern Ireland. Want to be part of Belfast’s next big fitness community? Sign up for a free trial today and come and see what One Element Belfast has in store for you.